Not to be confused with C-peptide, C-reactive protein, or protein kinase C.
Protein C, also known as autoprothrombin IIA and blood coagulation factor XIV,:6822 is a zymogen, the activated form of which plays an important role in regulating anticoagulation, inflammation, cell death, and maintaining the permeability of blood vessel walls in humans and other animals. Activated protein C (APC) performs these operations primarily by proteolytically inactivating proteins Factor Va and Factor VIIIa. APC is classified as a serine protease as it contains a residue of serine in its active site. :35 In humans, protein C is encoded by the PROC gene, which is found on chromosome 2. The zymogenic form of protein C is a vitamin K-dependent glycoprotein that circulates in blood plasma. Its structure is that of a two-chain polypeptide consisting of a light chain and a heavy chain connected by a disulfide bond. :4673 The protein C zymogen is activated when it binds to thrombin, another protein heavily involved in coagulation, and protein C's activation is greatly promoted by the presence of thrombomodulin and endothelial protein C receptors (EPCRs). Because of EPCR's role, activated protein C is found primarily near endothelial cells (i.e., those that make up the walls of blood vessels), and it is these cells and leukocytes (white blood cells) that APC affects. :34:3162 Because of the crucial role that protein C plays as an anticoagulant, those with deficiencies in protein C, or some kind of resistance to APC, suffer from a significantly increased risk of forming dangerous blood clots (thrombosis). Research into the clinical use of a recombinant form of human Activated Protein C (rhAPC) known as Drotrecogin alfa-activated, branded Xigris by Eli Lilly and Company, has been surrounded by controversy. Eli Lilly ran an aggressive marketing campaign to promote its use for people with severe sepsis and septic shock, and sponsored the 2004 Surviving Sepsis Campaign Guidelines. However, a 2012 Cochrane review found that its use cannot be recommended as it does not improve survival and increases bleeding risk. In October 2011 Xigris was withdrawn from the market by Eli Lilly due to a higher mortality in a trial among adults. Human protein C is a vitamin K-dependent glycoprotein structurally similar to other vitamin K-dependent proteins affecting blood clotting, such as prothrombin, Factor VII, Factor IX and Factor X.:1215 Protein C synthesis occurs in the liver and begins with a single-chain precursor molecule: a 32 amino acid N-terminus signal peptide preceding a propeptide. :S11 Protein C is formed when a dipeptide of Lys198 and Arg199 is removed; this causes the transformation into a heterodimer with N-linked carbohydrates on each chain. The protein has one light chain (21 kDa) and one heavy chain (41 kDa) connected by a disulfide bond between Cys183 and Cys319. Domain structure of preproprotein C (top) and the mature heterodimer (bottom). 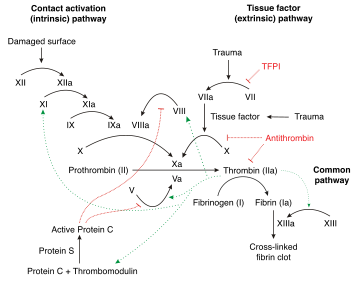 Several studies have indicated that the proteolytic activity of APC contributes to the observed cytoprotective properties of APC, but variants that are proteolytically inactive also are able to regulate formation of PAR-activators thrombin and factor Xa and express cytoprotective properties in vitro and in vivo. Activated protein C cleaves Plasmodium falciparum histones which are released during infection: cleavage of these histones eliminates their pro inflammatory effects. Protein C levels have long been noted to predict mortality in patients with sepsis. Because of this, and its pleiotropic anticoagulative and cytoprotective effects, protein C has been suggested, along with many other drugs, for use in treating patients with severe sepsis. Drotrecogin alfa-activated was the subject of significant controversy while it was approved for clinical use as it was found to increase bleeding and not to reduce mortality. In October 2011 rhAPC (Xigris®) was withdrawn from the market by Eli Lilly due to a higher mortality in a trial among adults. ^ a b c d e f Hall JA, Morton I (1999). Concise dictionary of pharmacological agents: properties and synonyms. Kluwer Academic. ISBN 978-0-7514-0499-9. ^ Hall JA, Morton I (1999). Concise dictionary of pharmacological agents: properties and synonyms. Kluwer Academic. ISBN 978-0-7514-0499-9. ^ a b c d e f g Nicolaes GA, Dahlbäck B (February 2003). "Congenital and acquired activated protein C resistance". Seminars in Vascular Medicine. 3 (1): 33–46. doi:10.1055/s-2003-38331. PMID 15199491. ^ a b c d e Foster DC, Yoshitake S, Davie EW (July 1985). "The nucleotide sequence of the gene for human protein C". Proceedings of the National Academy of Sciences of the United States of America. 82 (14): 4673–7. doi:10.1073/pnas.82.14.4673. PMC 390448. PMID 2991887. ^ a b c d e f g h i j k l m Mosnier LO, Zlokovic BV, Griffin JH (April 2007). "The cytoprotective protein C pathway". Blood. 109 (8): 3161–72. doi:10.1182/blood-2006-09-003004. PMID 17110453. ^ Eichacker PQ, Natanson C, Danner RL (October 2006). "Surviving sepsis--practice guidelines, marketing campaigns, and Eli Lilly". The New England Journal of Medicine. 355 (16): 1640–2. doi:10.1056/NEJMp068197. PMID 17050887. ^ Martí-Carvajal AJ, Solà I, Gluud C, Lathyris D, Cardona AF (2012-12-12). "Human recombinant protein C for severe sepsis and septic shock in adult and paediatric patients". The Cochrane Database of Systematic Reviews. 12: CD004388. doi:10.1002/14651858.CD004388.pub6. ISSN 1469-493X. PMID 23235609. ^ a b Kylat, Ranjit; Ohlsson, Arne (April 18, 2012). "Recombinant human activated protein C for severe sepsis in neonates". Cochrane Database of Systematic Reviews (4): CD005385. doi:10.1002/14651858.CD005385.pub3. PMID 22513930. ^ Mammen EF, Thomas WR, Seegers WH (December 1960). "Activation of purified prothrombin to autoprothrombin I or autoprothrombin II (platelet cofactor II or autoprothrombin II-A)". Thrombosis et Diathesis Haemorrhagica. 5: 218–49. PMID 13765990. ^ Stenflo J (January 1976). "A new vitamin K-dependent protein. Purification from bovine plasma and preliminary characterization". The Journal of Biological Chemistry. 251 (2): 355–63. PMID 1245477. ^ Kisiel W, Ericsson LH, Davie EW (November 1976). "Proteolytic activation of protein C from bovine plasma". Biochemistry. 15 (22): 4893–900. doi:10.1021/bi00667a022. PMID 990250. ^ a b c d e f g h i j k l m n o p q r s Mosnier LO, Griffin JH (2006). "Protein C anticoagulant activity in relation to anti-inflammatory and anti-apoptotic activities". Frontiers in Bioscience. 11: 2381–99. doi:10.2741/1977. PMID 16720321. ^ Kisiel W, Canfield WM, Ericsson LH, Davie EW (December 1977). "Anticoagulant properties of bovine plasma protein C following activation by thrombin". Biochemistry. 16 (26): 5824–31. doi:10.1021/bi00645a029. PMID 588557. ^ Vehar GA, Davie EW (February 1980). "Preparation and properties of bovine factor VIII (antihemophilic factor)". Biochemistry. 19 (3): 401–10. doi:10.1021/bi00544a001. PMID 7356933. ^ Walker FJ (June 1980). "Regulation of activated protein C by a new protein. A possible function for bovine protein S". The Journal of Biological Chemistry. 255 (12): 5521–4. PMID 6892911. ^ Griffin JH, Evatt B, Zimmerman TS, Kleiss AJ, Wideman C (November 1981). "Deficiency of protein C in congenital thrombotic disease". The Journal of Clinical Investigation. 68 (5): 1370–3. doi:10.1172/JCI110385. PMC 370934. PMID 6895379. ^ a b c d e Goldenberg NA, Manco-Johnson MJ (November 2008). "Protein C deficiency". Haemophilia. 14 (6): 1214–21. doi:10.1111/j.1365-2516.2008.01838.x. PMID 19141162. ^ Beckmann RJ, Schmidt RJ, Santerre RF, Plutzky J, Crabtree GR, Long GL (July 1985). "The structure and evolution of a 461 amino acid human protein C precursor and its messenger RNA, based upon the DNA sequence of cloned human liver cDNAs". Nucleic Acids Research. 13 (14): 5233–47. doi:10.1093/nar/13.14.5233. PMC 321861. PMID 2991859. ^ Taylor FB, Chang A, Esmon CT, D'Angelo A, Vigano-D'Angelo S, Blick KE (March 1987). "Protein C prevents the coagulopathic and lethal effects of Escherichia coli infusion in the baboon". The Journal of Clinical Investigation. 79 (3): 918–25. doi:10.1172/JCI112902. PMC 424237. PMID 3102560. ^ Dahlbäck B, Carlsson M, Svensson PJ (February 1993). "Familial thrombophilia due to a previously unrecognized mechanism characterized by poor anticoagulant response to activated protein C: prediction of a cofactor to activated protein C". Proceedings of the National Academy of Sciences of the United States of America. 90 (3): 1004–8. doi:10.1073/pnas.90.3.1004. PMC 45799. PMID 8430067. ^ Bertina RM, Koeleman BP, Koster T, Rosendaal FR, Dirven RJ, de Ronde H, van der Velden PA, Reitsma PH (May 1994). "Mutation in blood coagulation factor V associated with resistance to activated protein C". Nature. 369 (6475): 64–7. doi:10.1038/369064a0. PMID 8164741. ^ PROWESS: recombinant Human Activated PROtein C Worldwide Evaluation in Severe Sepsis; Bernard GR, Vincent JL, Laterre PF, LaRosa SP, Dhainaut JF, Lopez-Rodriguez A, Steingrub JS, Garber GE, Helterbrand JD, Ely EW, Fisher CJ (March 2001). "Efficacy and safety of recombinant human activated protein C for severe sepsis". The New England Journal of Medicine. 344 (10): 699–709. doi:10.1056/NEJM200103083441001. PMID 11236773. ^ a b Hosac AM (April 2002). "Drotrecogin alfa (activated): the first FDA-approved treatment for severe sepsis". Proceedings. 15 (2): 224–7. doi:10.1080/08998280.2002.11927844. PMC 1276518. PMID 16333441. ^ Riewald M, Petrovan RJ, Donner A, Mueller BM, Ruf W (June 2002). "Activation of endothelial cell protease activated receptor 1 by the protein C pathway". Science. 296 (5574): 1880–2. doi:10.1126/science.1071699. PMID 12052963. ^ Wildhagen KC, Lutgens E, Loubele ST, ten Cate H, Nicolaes GA (December 2011). "The structure-function relationship of activated protein C. Lessons from natural and engineered mutations". Thrombosis and Haemostasis. 106 (6): 1034–45. doi:10.1160/TH11-08-0522. PMID 22072231. ^ a b D'Ursi P, Marino F, Caprera A, Milanesi L, Faioni EM, Rovida E (2007). "ProCMD: a database and 3D web resource for protein C mutants". BMC Bioinformatics. 8 Suppl 1: S11. doi:10.1186/1471-2105-8-S1-S11. PMC 1885840. PMID 17430555. ^ Weiler-Guettler H, Christie PD, Beeler DL, Healy AM, Hancock WW, Rayburn H, Edelberg JM, Rosenberg RD (May 1998). "A targeted point mutation in thrombomodulin generates viable mice with a prethrombotic state". The Journal of Clinical Investigation. 101 (9): 1983–91. doi:10.1172/JCI2006. PMC 508785. PMID 9576763. ^ Gu JM, Crawley JT, Ferrell G, Zhang F, Li W, Esmon NL, Esmon CT (November 2002). "Disruption of the endothelial cell protein C receptor gene in mice causes placental thrombosis and early embryonic lethality". The Journal of Biological Chemistry. 277 (45): 43335–43. doi:10.1074/jbc.M207538200. PMID 12218060. ^ a b c d Esmon CT (September 2003). "The protein C pathway". Chest. 124 (3 Suppl): 26S–32S. doi:10.1378/chest.124.3_suppl.26S. PMID 12970121. ^ España F, Berrettini M, Griffin JH (August 1989). "Purification and characterization of plasma protein C inhibitor". Thrombosis Research. 55 (3): 369–84. doi:10.1016/0049-3848(89)90069-8. PMID 2551064. ^ Nicolaes GA, Tans G, Thomassen MC, Hemker HC, Pabinger I, Varadi K, Schwarz HP, Rosing J (September 1995). "Peptide bond cleavages and loss of functional activity during inactivation of factor Va and factor VaR506Q by activated protein C". The Journal of Biological Chemistry. 270 (36): 21158–66. doi:10.1074/jbc.270.36.21158. PMID 7673148. ^ Nicolaes GA, Bock PE, Segers K, Wildhagen KC, Dahlbäck B, Rosing J (July 2010). "Inhibition of thrombin formation by active site mutated (S360A) activated protein C". The Journal of Biological Chemistry. 285 (30): 22890–900. doi:10.1074/jbc.M110.131029. PMC 2906281. PMID 20484050. ^ Wildhagen KC, Schrijver R, Beckers L, ten Cate H, Reutelingsperger CP, Lutgens E, Nicolaes GA (July 2014). "Effects of exogenous recombinant APC in mouse models of ischemia reperfusion injury and of atherosclerosis". PLoS One. 9 (7): e101446. doi:10.1371/journal.pone.0101446. PMC 4102480. PMID 25032959. ^ a b Ansell J, Hirsh J, Hylek E, Jacobson A, Crowther M, Palareti G (June 2008). "Pharmacology and management of the vitamin K antagonists: American College of Chest Physicians Evidence-Based Clinical Practice Guidelines (8th Edition)". Chest. 133 (6 Suppl): 160S–198S. doi:10.1378/chest.08-0670. PMID 18574265. ^ Dahlbäck B (January 2003). "The discovery of activated protein C resistance". Journal of Thrombosis and Haemostasis. 1 (1): 3–9. doi:10.1046/j.1538-7836.2003.00016.x. PMID 12871530. ^ Gillrie MR, Lee K, Gowda DC, Davis SP, Monestier M, Cui L, Hien TT, Day NP, Ho M (March 2012). "Plasmodium falciparum histones induce endothelial proinflammatory response and barrier dysfunction". The American Journal of Pathology. 180 (3): 1028–39. doi:10.1016/j.ajpath.2011.11.037. PMC 3448071. PMID 22260922. ^ Abraham E, Laterre PF, Garg R, Levy H, Talwar D, Trzaskoma BL, François B, Guy JS, Brückmann M, Rea-Neto A, Rossaint R, Perrotin D, Sablotzki A, Arkins N, Utterback BG, Macias WL (September 2005). "Drotrecogin alfa (activated) for adults with severe sepsis and a low risk of death". The New England Journal of Medicine. 353 (13): 1332–41. doi:10.1056/NEJMoa050935. PMID 16192478. ^ a b Martí-Carvajal, AJ; Solà, I; Lathyris, D; Cardona, AF (14 March 2012). "Human recombinant activated protein C for severe sepsis". The Cochrane Database of Systematic Reviews (3): CD004388. doi:10.1002/14651858.CD004388.pub5. PMID 22419295. ^ Griffin JH, Fernández JA, Mosnier LO, Liu D, Cheng T, Guo H, Zlokovic BV (2006). "The promise of protein C". Blood Cells, Molecules & Diseases. 36 (2): 211–6. doi:10.1016/j.bcmd.2005.12.023. PMID 16464623. ^ Esmon NL, DeBault LE, Esmon CT (May 1983). "Proteolytic formation and properties of gamma-carboxyglutamic acid-domainless protein C". The Journal of Biological Chemistry. 258 (9): 5548–53. PMID 6304092. ^ Slungaard A, Vercellotti GM, Tran T, Gleich GJ, Key NS (April 1993). "Eosinophil cationic granule proteins impair thrombomodulin function. A potential mechanism for thromboembolism in hypereosinophilic heart disease". The Journal of Clinical Investigation. 91 (4): 1721–30. doi:10.1172/JCI116382. PMC 288152. PMID 8386194. 1lqv: Crystal structure of the Endothelial protein C receptor with phospholipid in the groove in complex with Gla domain of protein C.
This page was last edited on 14 February 2019, at 11:34 (UTC).